Tailback Deshawn McClease took to Twitter on Wednesday night to announce his transfer from Virginia Tech. McClease is the latest Tech player to announce his transfer, joining Chris Cunningham and Eric Kumah, who announced on Tuesday night. For his career, McClease had 212 carries for 433 yards (4.5 ypc) and five touchdowns. He also had 17 receptions for 161 yards during his career. 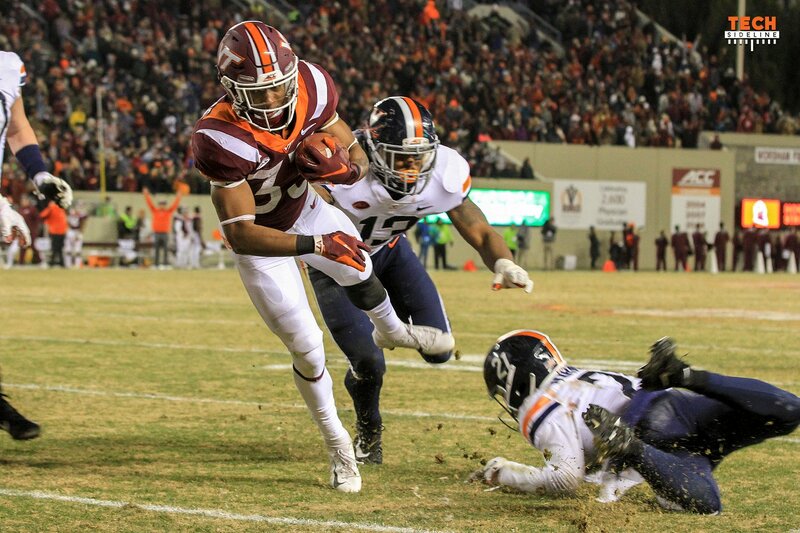 With McClease moving on, the Hokies will have the following running backs on scholarship for 2019: Jalen Holston (Jr.), Terius Wheatley (r-So. ), Cole Beck (r-Fr. ), Caleb Steward (r-Fr. ), Keshawn King (Fr.) and Tahj Gary (Fr.). Gary is expected to miss the 2019 season while recovering from a broken leg. Players used to have the [email protected] to compete. Did we have a team of cowards? Wasn’t McClease pretty much a shoo in to be the starter? Holston hasn’t done much. They didn’t even let Steward play his 3 free game without burning a shirt. Let’s hope Keshawn King is the man! Along with all of the trials and tribulations this team had to face, in addition there seemed to be a lack of “team” after the FSU game and no real senior leadership there to turn it around. I wish all of these guys the best, but maybe now we can have a group who really want to be Hokies. I certainly hope so. Coach Fu is a geeeeeeeenius. All part of the plan. Nothing to see here. As an outsider this one took me by surprise! He has played when healthy. Funny…I was thinking the SAME thing…You know, it seems none of them have the deep connection that many of US have to VT. I could have no more left Tech after my Junior year than fly to the moon! Hell, i had a hard enough time leaving after graduating my SECOND senior year..
Also, don’t think it is their best way to enhance their NFL stock. With the exception of Kumuth, all of them were back-ups.. Think about THAT for a minute..These are NOT future NFL guys; not if they couldn’t even start for us! Edmonds left for MD & improved his path to the NFL by not having to share the carries as much. Maybe (I don’t know) MacMillian did, too. Possibly McClease can find a home that will improve his chance of getting an offer. RB’s and kick returners all have a short shelf life in the NFL so they need a lot. I think Willis clearly won the job over JJ this year so JJ leaves looking for playing time. Understandable. I wish him well. Although, I’m not real sure he has a shot at the NFL. I could see coaching in his future so picking the brains of different coaches would be a plus. Kumah is the one who’s the head scratcher? He’s definitely NFL material but I do not see how he improves his chance of showcasing his ability by going elsewhere. If anything his transfer is a red flag to the scouts. I’m not saying it will hurt him but if I was an NFL scout I’d want to now why he left VT & I better feel comfortable with the reasons. Same goes for for Rico & Hill. Those guys certainly have the ability to get a look but the scouts will need to feel comfortable with their VT exits. All things being equal… you pick the guy who is less drama so it could hurt their draft standings. Bad mouthing your ex teammates, coaches or schools is just dumb drama. Will the last one out the door please turn out the lights. Come on Cole! Get your spring track done and run hard at summer camp. Cole Beck can win a game of Connect Four in only 3 moves. Does David Wilson have a son? Good to see he thanked all of his coaches. Sorry to see him go, but best of luck. Awesome, I mis-type “editor”. Oh well. 212 carries for 990 yards in his career.